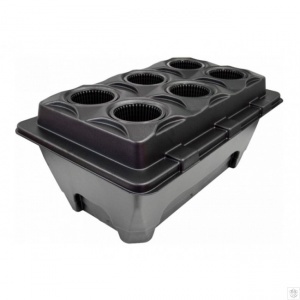 Oxypot V6 can be used for vegetative growth. The roots grow through the mesh pots into the misting chamber full of nutrient solution. The air pump constantly oxygenates the solution and the roots have constant access to water, nutrients and oxygen for exceptionally fast growth. It's impossible to saturate plants in an Oxypot because the roots only take up what they need when they need it. Just keep the misting chamber topped-up and it's impossible to underwater because the solution is always available to the plants.